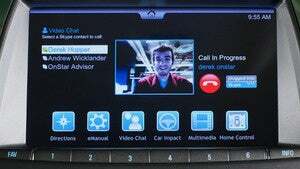 OnStar to demo in-car video chats—that sounds safe, right? While lawmakers are passing stricter regulations on cellphone usage in cars, OnStar seems to be bucking that trend. At CES they'll be showing off a new in-car 4G infotainment system that will stream video content and allow for video calls. The new system is being rigged up in one of the company's Chevy Volt research vehicles, and before you cry foul over the prospect of drivers being further distracted by a video call, GM claims that functionality can only be used when the vehicle is in park.